Sign the e-petition to ask politicians to stop the cull of badgers. The petition needs at least 100,000 people to sign it before government will consider debating the issue in parliament. However, because the badger cull debate has already seen its fair share of u-turns and ignoring of scientific findings by authorities, those of us fighting the cull want to see as many signatures recorded as possible, making public opinion on the matter simply impossible to ignore. I am going to assume that because you are on my blog, you are either my mother or you have at least some interest in wildlife and conservation. I am also going to assume that because you are still reading this piece, you find the issue surrounding the badger cull in Britain of interest. In which case, I will ask you again to please sign the e-petition. If you’re still uncertain about what you’re signing and fear that you may be aligning yourself with extreme animal rights activists and an anti-farmer movement, fear not. The petition merely requests government employs an alternative approach to culling badgers in the control of TB in cattle. Vaccination is already a viable alternative but it is being developed even further with plans to make an oral vaccine for badgers widely available. Those of you that follow my work will recall my 2011 BBC Wildlife feature that highlighted vaccination as a viable alternative to culling. There is further information about all of the options and science on the Badger Trust website. The UK has already extirpated a long list of animals, many of which were seen to be somehow incompatible with humans and our farming practices in particular. Don’t let the badger join the lynx, white-tailed eagle, osprey, wild boar and wolf. Sign the petition! I’m excited and proud to say that my badger vaccination feature is the cover story of the Autumn 2011 issue of BBC Wildlife Magazine. The portfolio was shot in Gloucestershire in the UK while working alongside the magazine’s environment editor James Fair. 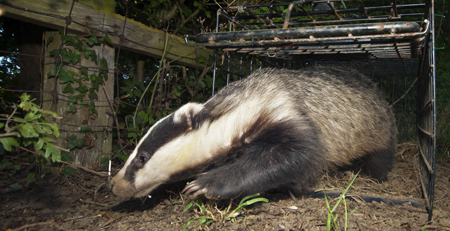 The feature looks at the Badger Vaccine Deployment Project being undertaken by Fera as a trial to understand the viability of vaccinating badgers (instead of or alongside the proposed cull) to protect cattle from bovine tuberculosis (bTB). You can see a gallery of the shots on the magazine’s website discoverwildlife.com and see more of the portfolio on my website in the Stories section. This week I had the opportunity to return to a badger sett that I had visited last year. The first night was full of activity with five or more badgers out play-fighting, collecting bedding and looking for food. I know there are around eight adults and sub-adults and hopefully we’ll see some youngsters soon. Although I was in the perfect spot for watching them, a few small branches made photography difficult and I could only manage a few shots. Also, because my legs went to sleep after the first half hour it was clear that I was going to have to reconsider my positioning. The second night was different in so many ways. I got there before sunset to give myself the time to set up and get comfortable. I had brought an extra light of my own this time to create a better and more even lighting effect (I opted for continuous lighting as opposed to flash). Anyway, despite this and my new position lying flat on my front under a low branch, I was made to wait almost two hours before seeing my first badger but it was heading in the wrong direction up a path away from the sett. And this is pretty much how the rest of the night went – me lying on a combination of stones, twigs and roots having to listen to badger activity twenty metres away behind a stand of trees! Anyway, welcome to the unpredictable world of widlife photography! But it’s quiet nights like this that make you appreciate why you do it, that remind you that animals like badgers are wild and that they will do what they want and go where they like on their own watch. 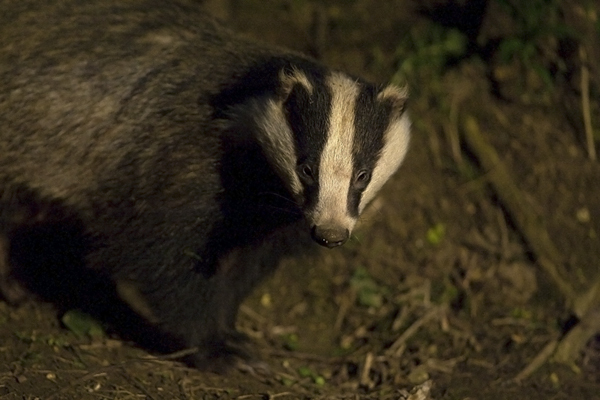 And for me, the chance to even see a family at a sett behaving normally within two metres of me just makes it special! But all is not rosy in the world of Badgers. They are accused of spreading TB among cattle and subsequently costing farmers and taxpayers millions of pounds every year. Although Hilary Benn has repeatedly ruled out a cull in England in favour of further research into alternative methods of controlling the spread of the disease, culling seems to be on the cards in Wales and the church has added their support for a cull in the south-west.